Paolo Posi (1708 - 1776) was a prominent architect in XVIIIth century Rome, however there are very few works of him, for the simple reason that in XVIIIth century Rome there was little need for building new churches and palaces and more important there was no money. Posi's fame is mainly due to the ephemeral fake buildings erected for the fireworks of the "Festa della Chinea" (the white horse donated every year by the King of Naples to the Pope). These fake buildings, made of wood and papier mache, were often erected to celebrate the appointment of a cardinal or the arrival of a new ambassador. The materials used and the fact that the constructions (or machines, as they were called) lasted a few days allowed all sorts of extravagant and theatrical effects. In 1771 Paolo Posi was asked to design the tomb of Maria Flaminia Odescalchi Chigi: the Chigi had already a family chapel (designed by Raphael and completed by Bernini) in S. Maria del Popolo, but Posi felt that the severe atmosphere of the chapel was not the proper setting for the tomb he had in mind, so he put it outside the chapel in the nave. Maria Flaminia Odescalchi was the young wife of Ferdinando Chigi. She died at the age of 20, giving birth to her third child. 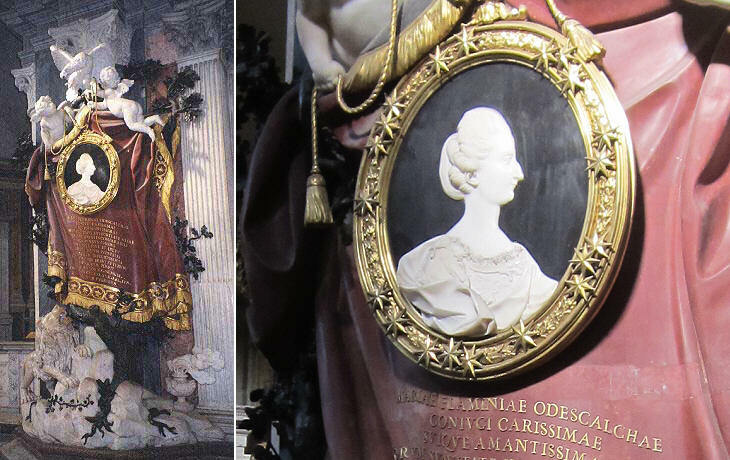 Chigi and Odescalchi had both a pope in their past and quite important ones (Alexander VII Chigi - Innocent XI Odescalchi) and they both had complex coats of arms. The tomb designed by Posi is far more a celebration of the heraldic symbols of the two families, than a compassionate tribute to a young woman. The bizarre assemblage of subjects has a rationale: each subject with the exception of the two angels is an element of the coat of arms of the two families. 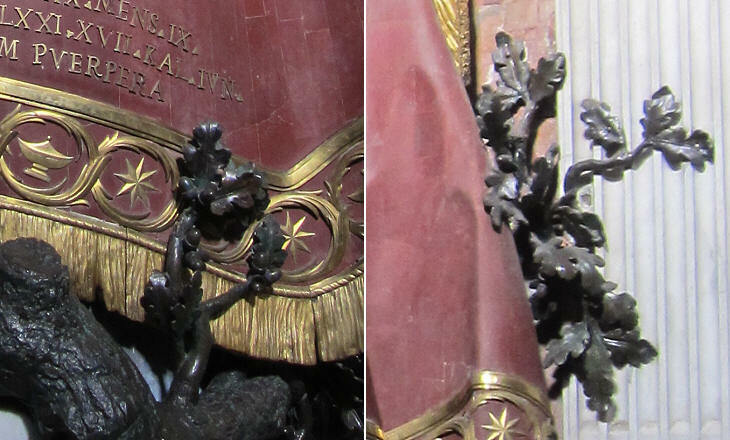 The little monument clearly shows the influence of Bernini (in particular Bernini's monument to Maria Raggi in S. Maria sopra Minerva and the two gigantic coats of arms of Alexander VII over the organ in S. Maria del Popolo, with oak branches and leaves coming out the pipes) and the experience gained by Posi in designing ephemeral machines. 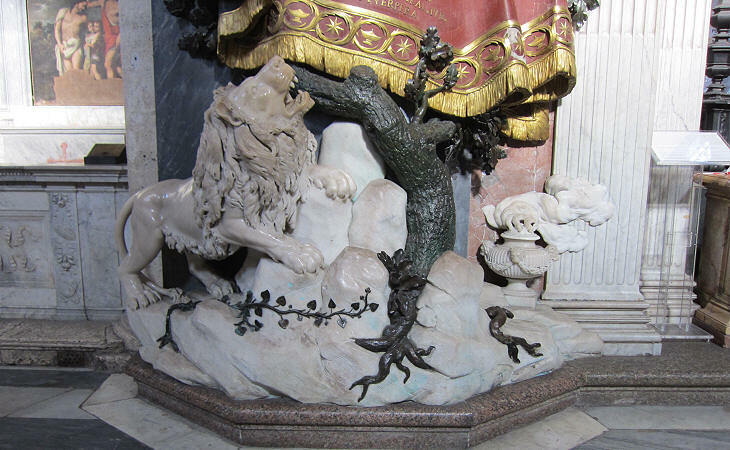 In the lower part of the monument a lion (Odescalchi) is climbing a mountain (Chigi); to the right of the mountain one can see an incense burner (Odescalchi) and even the twists of the smoke. The inscription is supported by a bronze oak (Chigi). Most likely the Chigi themselves influenced Posi in using different materials and colours as a reminder of Alexander VII's tomb by Bernini. The tomb is topped by an eagle (Odescalchi) and two angels carrying a portrait of the dead. The star of the Chigi and the incense burner of the Odescalchi are used as a decoration of the inscription (also in the image used as background for this page). At first the tomb had a great success and was celebrated as a masterpiece, but this success was as ephemeral as the machines built by Posi. Neoclassicism and the French Revolution criticized anything which was associated with the Ancien Regime and soon labelled Posi's work as "confused bad taste". Stendhal wrote in his Promenades dans Rome "L'exécrable gout du XVIIIe siècle éclate dans le tombeau de la princesse Odescalchi-Chigi (December 13, 1827)." 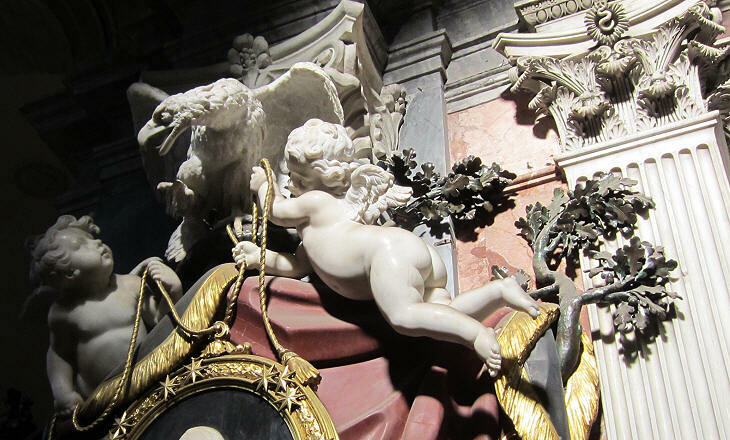 It is definitely a minor work and a repetition of more vigorous ideas, but nevertheless it attracts the attention of all those who visit the Chigi Chapel and vainly look in their guide for a comment on the tomb of Maria Flaminia Odescalchi Chigi.